People feel much better about the state of their personal economic situation than they do about national economic conditions. In 16 of 21 countries people are significantly more likely to say their economic condition is good than to say their country’s economy is doing well. This is particularly true in Spain (51 percentage point difference), Britain (49 points) and France (46 points). Only in China are people far more upbeat about the national economy than they are about their own finances. Among those who feel the most satisfied about their own economic well-being include the Brazilians (75%), the Germans (74%) and the Chinese (69%). If there was any doubt that a college education pays off: in 15 nations, people with a college degree were more satisfied with their economic situation than were those who did not have a college education. Nevertheless, the global economic crisis has exacted a heavy toll on some people’s perception of their personal economic situation. In five of the 15 nations where there is comparable data, people’s sense of their own finances has deteriorated to a significant degree since 2008, especially in Pakistan (down 19 points), Poland (down 18 points) and Spain (down 11 points). The greatest improvements in awareness of individual economic wellbeing since 2008 have been in Turkey (up 20 points) and Germany (up seven points). People may think their personal situation is better than economic conditions in their nation, but only in Brazil (72%) and China (70%) do large majorities think their families are better off than they were five years ago. 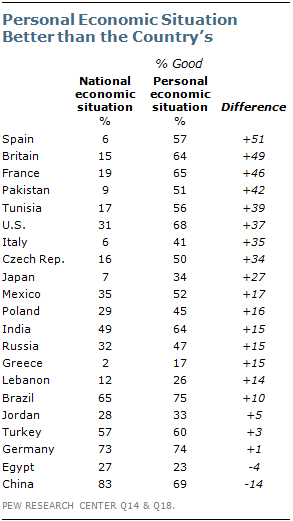 On balance, Indians (50%) and Turks (43%) also say their situations have improved. However, majorities or pluralities in 9 nations say their family financial situation has deteriorated. Solid majorities hold this view in Greece (81%), Spain (60%) and Pakistan (57%), as do at least four-in-ten in Lebanon, Italy, France, Britain, the Czech Republic, Japan, Egypt and Poland. Faith in upward economic mobility is abysmal all over the world. Only in China (57%) does a majority believe that it will be easy for young people today to become wealthier or to get a better job than their parents. The Europeans are the most pessimistic about their children’s chances of climbing the economic ladder. Eight-in-ten or more in Britain, Japan, Lebanon, Pakistan, Egypt, the U.S., Poland, Germany and the Czech Republic say it is difficult for young people to become as economically successful as their parents. Such pessimism is particularly strong in Greece, where 73% say it will be very difficult for today’s kids to advance economically, Spain (69% very difficult) and Pakistan (65% very difficult). Despite their gloom about their current economic situation and their pessimism about their children’s prospects, people generally believe that they are better off than their parents. Majorities in 14 of the 21 countries and pluralities in three more think they are doing better than the previous generation. Those most pleased with how far they have come economically are the Chinese (92%) and the Brazilians (81%). Even 71% of the Spanish, whose economic mood is among the worst in the world, whose economic confidence has fallen more than any other country in the wake of the global downturn and who are among the most pessimistic about prospects for the next generation, still recognize they have come a long way. But young people ages 18-to-29 in Britain, France, Spain, Russia, Italy and Greece are much less likely than those 50 and older to think they have a better standard of living than their parents. Nevertheless, in Mexico and Tunisia, those under 30 are more likely to think they have a better standard of living than their parents.